Vitamin A is a fat soluble vitamin. It is insoluble in water or glycerol but soluble in most organic solvents. It is sensitive to oxidation by air in the presence of light. Absorption of vitamin A increases if it is taken with fats but absorption of Vitamin A is more rapid in men than in women. Approximately 80% of vitamin A is absorbed in the human system and rest of 20% of vitamin A which is not absorbed is excreted within one or two days into the feces. Vitamin A mostly comes from animal foods, but some plant-based foods supply beta-carotene, which your body then converts into Vitamin A.
Vitamin A is found in dark green and yellow vegetables such as broccoli spinach, turnip greens, carrots, squash, sweet potatoes, pumpkin. Fruits that are good sources of vitamin A are apricot, cantaloupe, grapefruit, mango, watermelon and dried plums. In addition, liver, milk, butter, cheese, and whole eggs are also good source of Vitamin A.
Vitamin A, when converted into the retinal (retinaldehyde) form, is vital for healthy eyes. It allows the eye to effectively distinguish between light and dark, thus improving night vision. 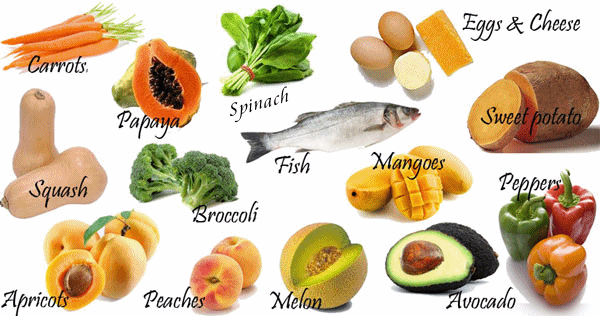 Vitamin A also helps for vision in dim light. Vitamin A helps your eyes adjust to light changes when you come in from outside and also helps keep your eyes, skin and mucous membranes moist. Furthermore, vitamin A is believed to fight against cataracts, macular degeneration, glaucoma and other age-related ocular diseases. When converted into retinoic acid, vitamin A effectively maintains healthy bones and teeth.Vitamin A also plays an important role in replacing worn out or old tissue with newer tissue to ensure healthy bones and teeth. Urinary calculi, or solid particles in the urinary system, may cause pain, nausea and vomiting when stones are formed. Vitamin A produces a mineral compound within the body called calcium phosphate that prevents the formation of these solid particles. Vitamin A is a powerful antioxidant that fights against free radicals that can damage the skin through oxidative stress and may cause premature wrinkles and age spots. Vitamin A combat these skin damaging free radicals and prevents from premature aging. Vitamin A helps in maintaining proper moisture in the skin and by maintaining proper moisture skin not only remains protected from common dryness, but also keratinization (the process in which the epidermis hardens into a heavy material that makes up hair and nails), psoriasis (a skin disease marked by red, itchy or scaly patches), acne, and even wrinkling. Vitamin A helps to keep the skin soft and supple by ensuring moisture retention, thereby preventing dryness, keratinization and skin conditions like psoriasis. It is said that Vitamin A may help in the prevention of cancer in organs and glands with epithelial tissues such as the mammary glands, skin and passages of the body. The lungs, gut, bladder and reproductive organs (including prostate gland) are lined by epithelial tissues. Vitamin A helps to reduce excess sebum production and hence reduces the risk of acne. Vitamin A activates genes that cause skin cells to mature and rise to the surface. This opens up the skin over pores and helps a lot to prevent acne. 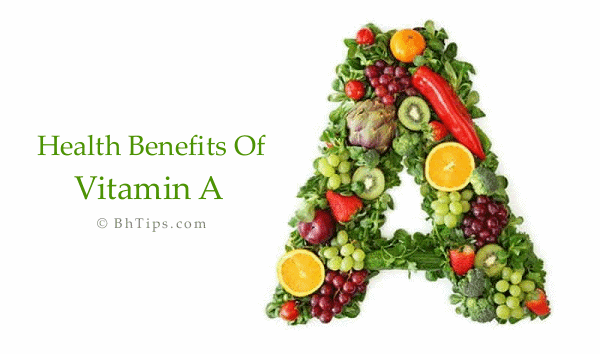 Vitamin A is also important for the proper maintenance of the skin tissues and mucus membranes. Antioxidant properties of Vitamin A flushes out the toxins from your body and cleanses the system. Vitamin A helps to keep your body free from free radicals and toxins, which might cause damage to your skin. Vitamin A plays not only repair damaged tissues but also plays an important role in replacing old and worn out tissues with new ones. Vitamin A is known to be essential for the reproductive process for both males and females. This Vitamin is also important for proper health and functions of reproductive system. Men also use vitamin A to raise their sperm count. As a powerful antioxidant, vitamin A fights against oxidative stress, or "cellular rust," within our bodies, thus helps a lot to protect from health problems such as atherosclerosis, cataracts, chronic obstructive pulmonary disease, and cancer. Additionally Vitamin A also helps prevent premature wrinkles and age spots. Although Vitamin A has many health and beauty benefits but still you should avoid overdoses of vitamin A because excessive intake or overdoses of Vitamin A can causes abdominal pain, nausea, vomiting, blurred vision, irritability, drowsiness, loss of hair and fatigue.